This November my husband’s college classmate/roommate/close friend will be getting married to his fiancée (who is now a part of our tight-knit circle of friends). Our friend’s fiancée is originally from Taiwan; her entire family is still based in the city of Taipei, & they are planning on getting married there in a few months. Our entire circle of friends are planning on attending the wedding, so it’s going to be pretty amazing. Since the wedding is fast approaching, my husband & I have started to get ready for our trip by digging up all of our travel necessities from our storage closet, & also getting a few extra items here & there. This past weekend, I went shopping with a friend & we stopped by one of our favorite Japanese home goods stores: MUJI. I picked up a few new items for my upcoming overseas trip. 1. 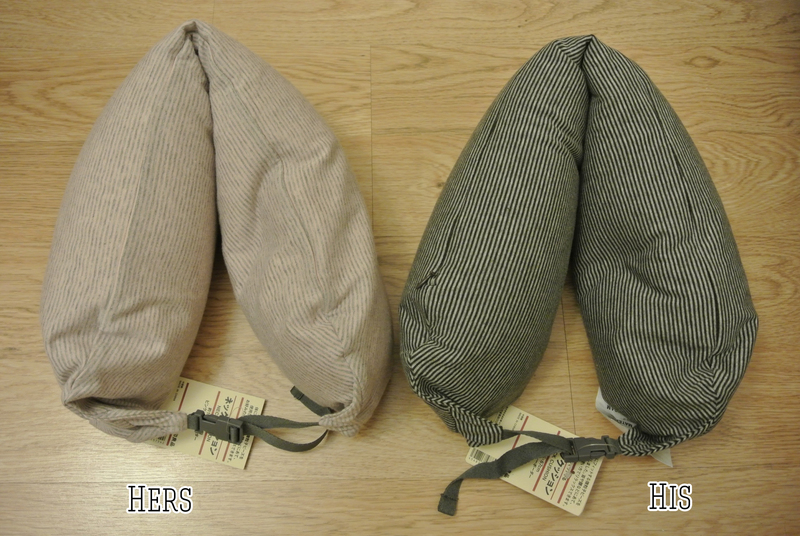 His & Hers travel neck pillows: This is the first time we will be using neck pillows on our fight. It’s a curious thing why we haven’t used them before, since we tend to travel overseas often, but we are using them now, so… & these neck pillows are very versatile. The strap is adjustable & this neck pillow also does triple duty: 1. a neck rest (obviously), 2. a waist pillow for lower back support, & 3. a foot rest when you open it horizontally. The cover can be removed & machine washed. I got a pink & grey striped one for myself & a charcoal & grey striped one for my husband. 2. travel slippers: We always bring a pair of slippers with us on our overseas flights, so as soon as the plane takes off, so do our shoes. It is much more comfortable to take off one’s shoes on a long flight, & it helps to have a pair of slippers on hand to wear on the plane. 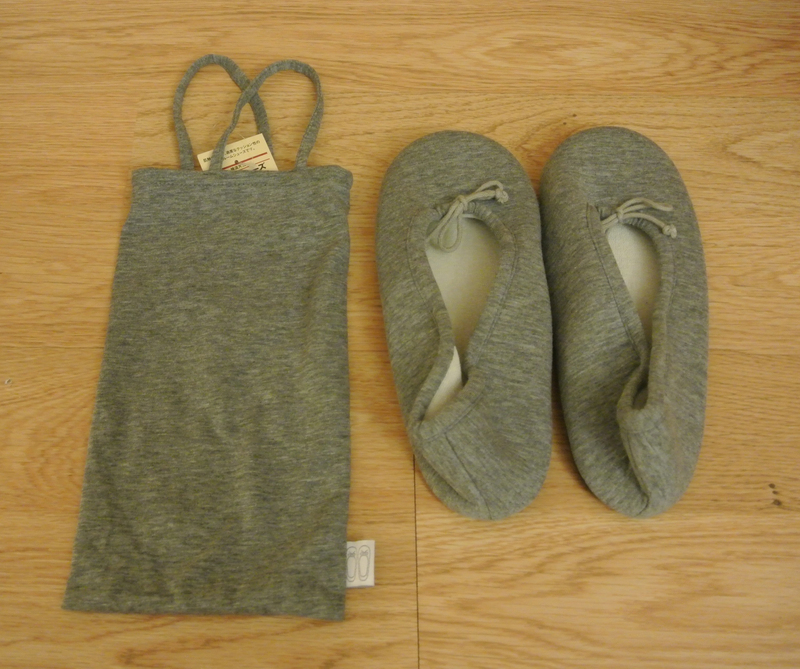 These room slippers are very comfortable, affordable, & come in a handy carrying case. This is very slim in size, so it’s easy to stow away in a backpack without taking up much space. 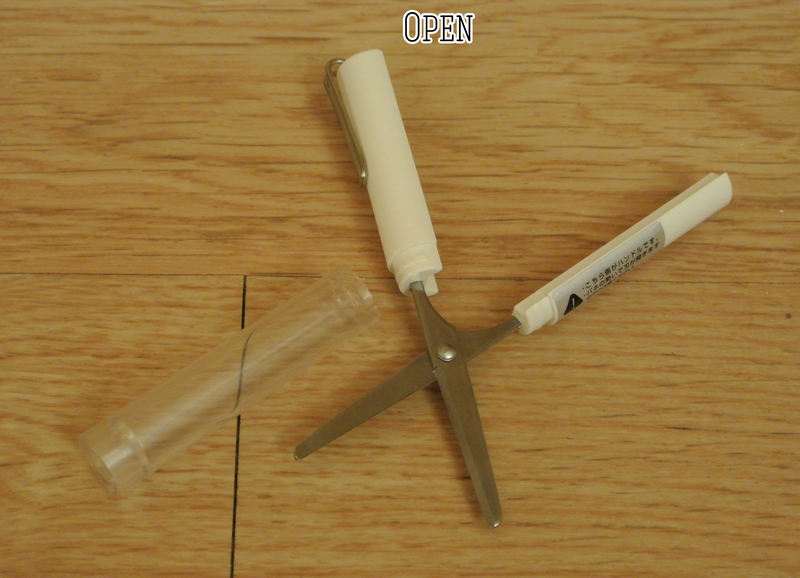 3. portable folding scissors: These small scissors are very handy. They fold up like a pen, & they are easy to carry around in a backpack or a purse. There have been many times my husband & I have needed a pair of scissors in our overseas hotel room & were not able to locate one. Of course I won’t be bringing this on the plane, but I will be packing this for sure. Ok, so I couldn’t end this post without mentioning that I also went a little nuts again with some stationery shopping. I couldn’t help myself! Well, it was mostly because I had a store credit voucher to one of my favorite stationery shops (& that voucher was practically burning a hole in my wallet). 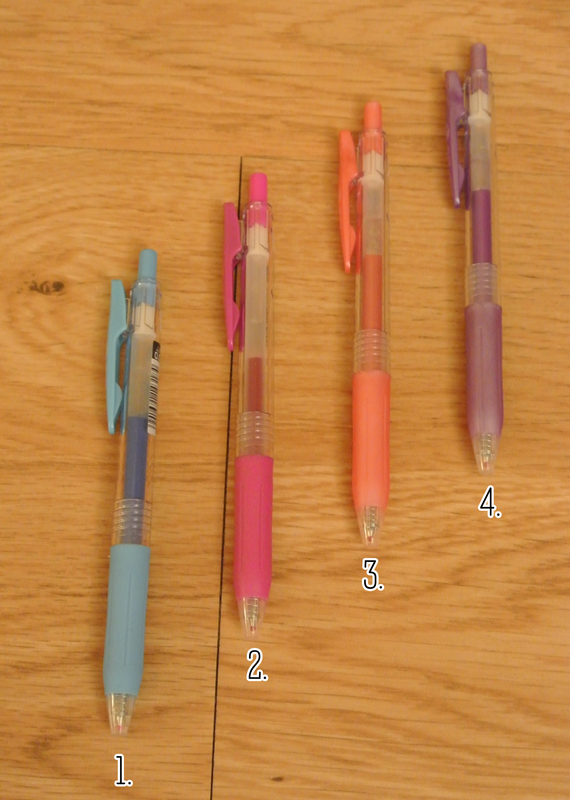 Anyway, I didn’t exactly go buck wild, but I did end up getting some new pens.